I don't know about you, but I get inspired by the dollar store. Seeing all those cheap doodads gets my mind going. Of course, I'm thinking about what I can do with such cheap supplies. Yesterday I came across this plain kitchen towel. How perfect for embellishing! I was tempted to buy a dozen of them, but held back because I wasn't sure how well my idea would come out. 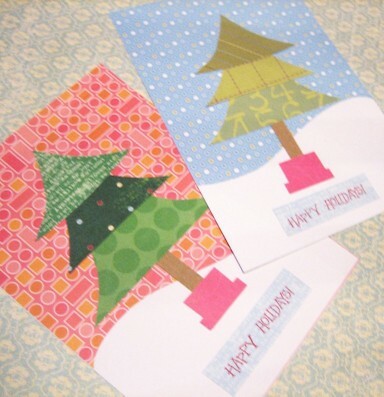 I used the same design as my Christmas postcard, but used fabric. In fact, I used scraps from my Wee ornaments. 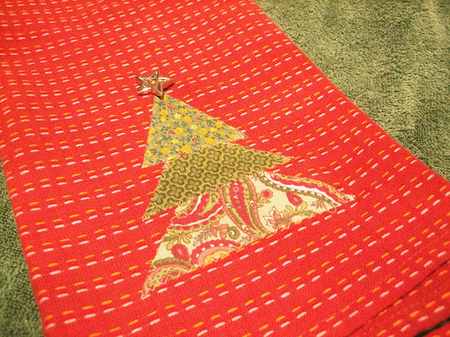 After a little heat-n-bond, some zig-zag stitches, and a star button from my stash I have a cute Christmas kitchen towel. All for $1. Wouldn't this be a great gift? Especially if you pair it with a jar of cookie mix and a wooden spoon? How about wrapping a loaf of homemade bread in it as a hostess gift? The possibilities are endless! The two swaps that I'm currently participating in, a Cookie Swap and Post Card Swap, have really stretched my imagination. I thought they'd be easy, but I was wrong. As much as I like to look at pretty papers, I have a hard time coming up with ideas on how to use them. My first challenge was the cookie swap. 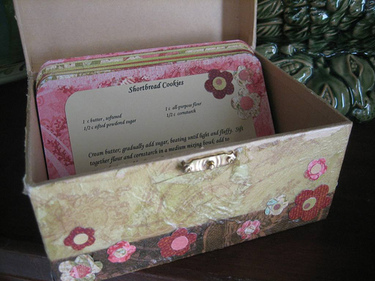 The idea was to come up with some sort of decorated recipe cards and recipe card container. I'm real original, I went with a recipe card holder. I decided to decoupage my holder, which was a lot of fun. An important lesson to note is that mod podge doesn't come off of the kitchen counter easily, so be careful where you use that stuff. 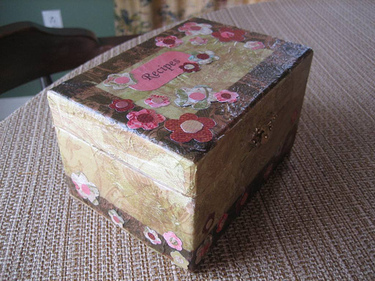 After I decoupaged my holder I was a bit lost, so I went on my first trip to a scrapbook store. Oh. my. god. Those papers were so pretty. I was in a paper buying frenzy, but I really didn't know what I wanted to do with the paper. After much hemming and hawing I came up with my design for my cards, then decoupaged my holder some more to match my cards. Yes, it looks like a kindergarten did it. I do not scrap book and I have no clue how to do that kind of stuff. I visited a few scrap book blogs for inspiration, any boy, there are some talented people out there. How they achieve such beautiful results with all those layers of papers and mixed media I'll never know. Seeing all that kind of made me want to pitch mine, but then I'd have to make something else. Gabi, I hope you like what I've made. I also made some goodies in the media I'm most comfortable with (fabric), but I'm saving that for a surprise. You'll have to wait until your package arrives! Yes, I know I could have made some sort of recipe card/holder thingy using fabric, but I didn't want to. I wanted a challenge. And I got it. 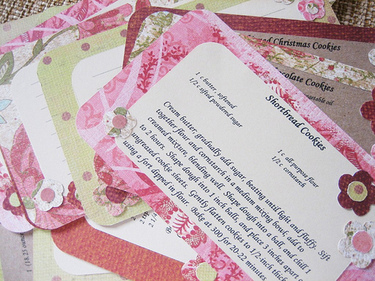 The next project involving paper that I've been working on is a Christmas post card swap. This was fun. After the cookie swap, this was a breeze. I don't know why, but I found this much easier. I ended up making two versions of these postcards. Simple, but cute. Both of these swaps made me realize that I like simple things. And there's nothing wrong with that. Now my next challenge is getting these things to the post office! Yeah, Thanksgiving is over and Christmas is all shoved in our faces, but I'm just not feeling it. Don't get me wrong, I love Christmas and all it's glory, but I'm not ready for it yet. I don't have a single decoration hung nor a present bought, and I'm really not in a hurry to do either. Last night I did rearrange my living room in preparation for the tree, but that's about it. Oh yeah, I also took down all the fall decorations. The thought of pulling down all my decorations and creating a huge mess in my living room does not appeal to me. What? You don't make a mess pulling out all your Christmas decorations? Well, we sure do! 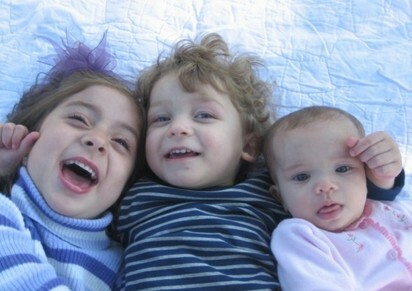 With all my little helpers it's going to be a three ring circus when we do start pulling that stuff out. Now that I've made myself out as a big ole Scrooge (which I'm not), here's a little project I worked on this weekend. Yes, it's Christmas related. 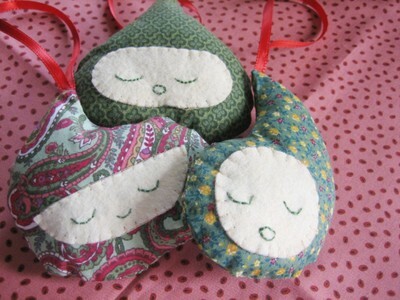 I made a set of Wee Ornaments found in the Winter edition of Cutting Edge. I think they turned out well. See, I'm not all that much of a Scrooge. Bah Humbug! I finally did it, I got my etsy shop up and running. It isn't anything special and it doesn't contain much, but it's there. 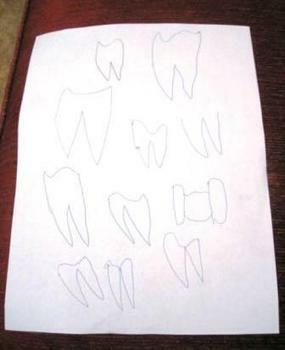 Whew, what a relief to get this done! This is something that I've been wanting to do for a long time, so I feel a great sense of accomplishment to finally get here. 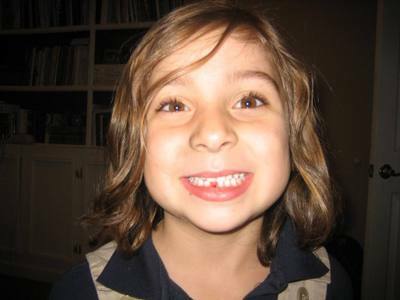 I've come a long way. Not so long ago I had absolutely no confidence in the things I made and would never think to actually sell anything. In fact, I'm still a little nervous about it. Thank you all for your positive comments and encouragement. I never would have been able to take this step without you! 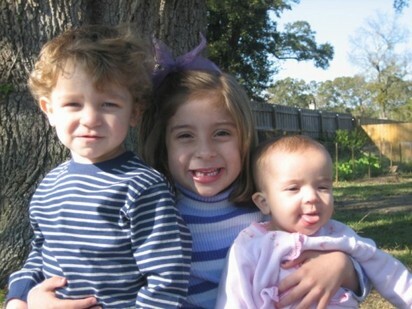 Time to gather the wee ones to take a picture for the annual Christmas card. Oh boy, what fun that was. Let me say this has been the toughest year yet. 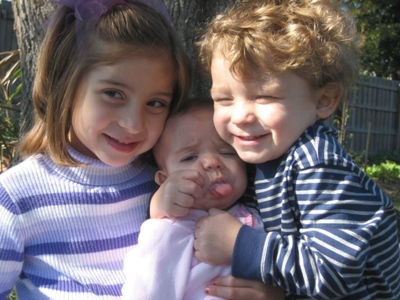 Getting both Alex and Ava to cooperate was a chore. When Ava wasn't crying or staring at her shoes (a little shoe lover in the making) Alex kept wanting to run away, the little turd. Then to make it even more challenging, we were on constant nose wipe duty. 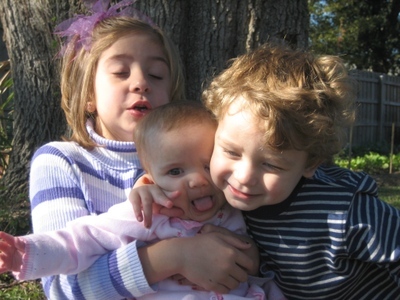 Why is it that right when the kids are in the perfect pose one has to have snot dripping out of their nose? We can't have snotty noses on the Christmas card! There were numerous unusable photos, but I kind of liked this one. And this one. They make me laugh. So I ordered them both. Lucky for me, I was able to get some good one on one pics too. Okay, I think we're good in the picture department for a while. 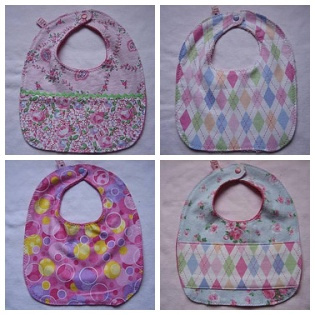 I've recently discovered that I really like to sew baby stuff. There are many reasons why, but the main ones are #1 I have a baby, #2 they're really cute, and #3 most baby projects are quick and easy. Last week while I was off, I worked on a stack of bibs. They're a necessity right now in my house because Ava has become the drool queen. I gave a few away as gifts, but kept most of them. I still need more. Good thing I like to make them. Look, another elephant! This was my WIP from last week. Didn't he turn out well? He's a raw edge applique, blanket stitched to a onesie. It took me a while, but I finally got around to using one of those blank onesies I ordered while I was still pregnant. Good thing I didn't order newborn sizes. 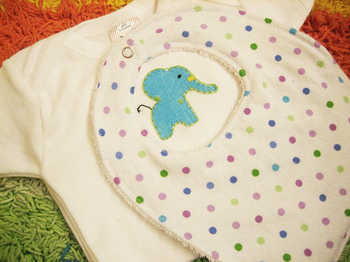 The front of this bib is white terrycloth and also has an elephant on it. You can check it out on flickr. I can see myself really getting into embellishing blank onesies and t-shirts. 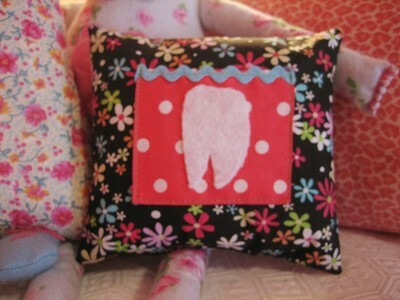 Wouldn't it be cute to make matching bottoms out of the same fabric as the applique? You can bet that Ava will be wearing some custom clothing soon! Thank you all for your kind posts a few days ago about my being in a funk. Things are getting better. I think a little retail therapy in the form of new shoes and a little crafting time did the trick. Just in case you're wondering, I bought some brown Mary Jane wedges, and a pair of black pumps, just because they were cute and on sale. I can't wait for them to come in! I used to not care so much about shoes, but now I'm addicted. Shhh, don't tell my husband! 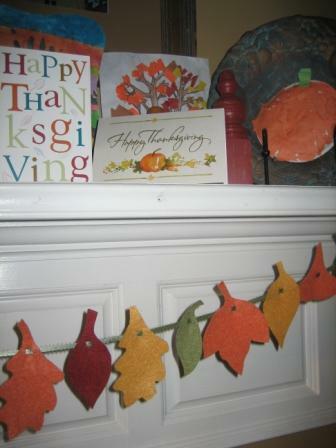 I love using applique to spruce up simple projects! I think I finished this whole project in about an hour. If I had more time I would have lined it, but it'll do for now. 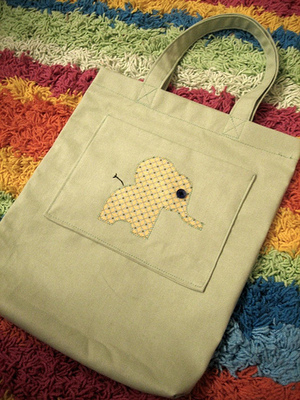 He's really into yellow at the moment, so the yellow elephant is perfect for him. He was thrilled to have a little surprise when he woke up this morning. Yes, I have been doing a little crafting lately. Now that I know they've been received, I can share. 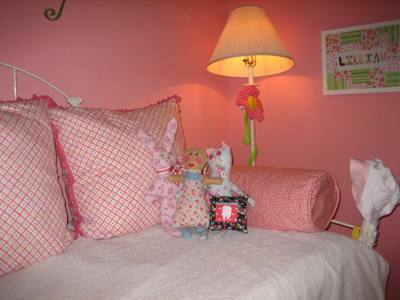 Here are a few of the things I made for Catrina. A pin cushion and a yo-yo covered journal. 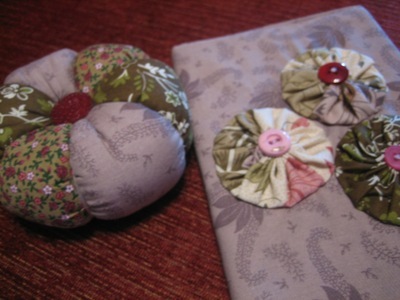 Some covered buttons. Aren't they cute? The little owls are my favorite. That's some Japanese fabric I bought to use in my first Back Tack swap. 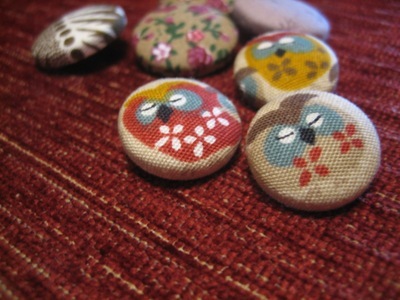 I am officially addicted to covered buttons. The possibilities are endless! I also made her a headband and sent along some other goodies, but those weren't interesting enough to photograph. I love taking on little projects like these, things that I can start and finish in a reasonable amount of time. Now that my hair is long enough, I need to work on some headbands for myself. I can't tell you how tempted I was to keep the one I made for Catrina for myself!